One of the nicest and simplest ways to send a thank you is via a hand written note or letter. It does not take much effort, and the after effect is lasting. People who send out thank you notes are regarded as polite and gracious. If someone has done something nice for you and sent you a gift, then they deserve a thank you message for their trouble. A thank you note does not have to be elaborate, but it should be personal. One should write as neatly as possible on cute stationary for the best effect. Begin the note with a simple “thank you for…” Next, expand on the thank you with more specifics to show that you really have enjoyed their help or the gift. As you can see, writing a thank you note does not have to be rocket scientist. People want to be acknowledged, and the best way to do is by sending them a note. If anything, people will be more apt to help and give to you in the future if you thank them now. A birthday is a great time for friends and family to celebrate you. They might feel compelled to give you thoughtful little gifts or throw you an elaborate party. It does not matter what it is because you will feel the love on your birthday. 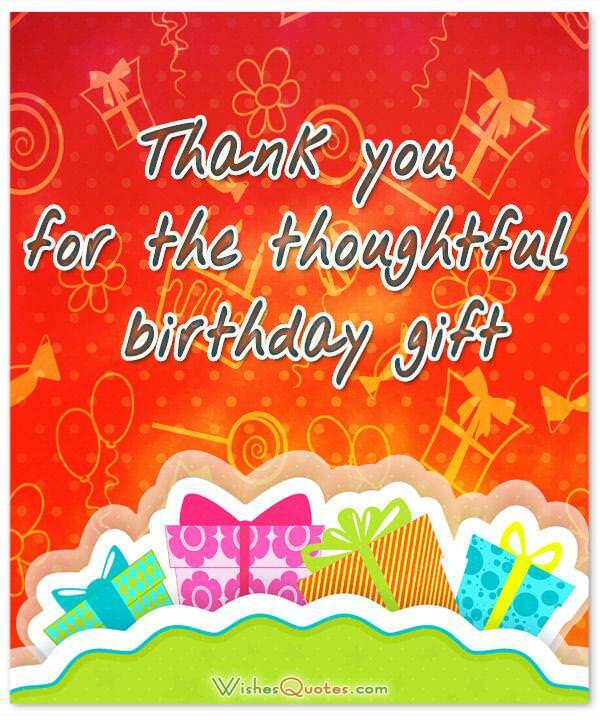 Therefore, you need to return the favor with a simple thank you for all your wonderful birthday surprises. 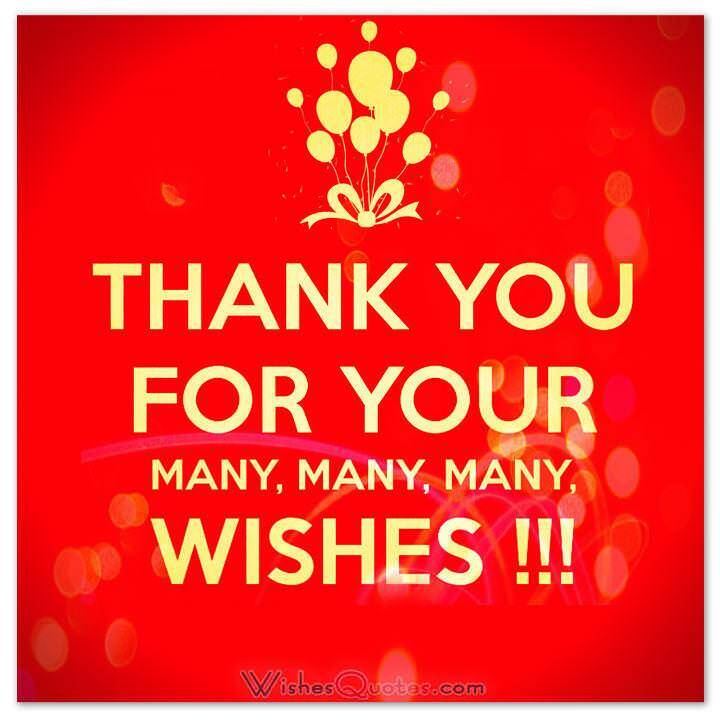 A birthday thank you note is a note written to show appreciation and to recognize the effort another person has made on your behalf. It is always wise to keep notes to our seniors more formal while those to our friends can be casual and fun. Below are some of the samples. I was so incredibly touched by your birthday gift. It meant so much to me that you got me my favorite (thing). I will think of you whenever I use it. 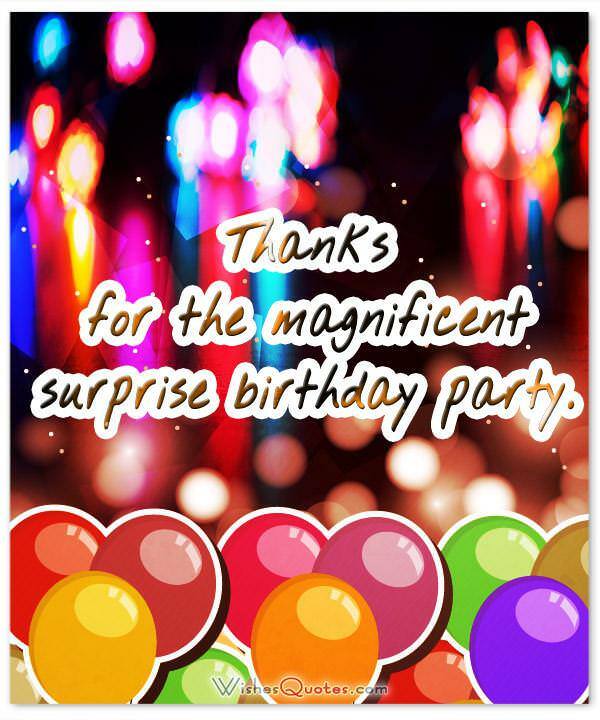 I only hope that I can think of something just as great to give you on your special day! One of the nicest things about my birthday this year was spending it in your company. Thank you for taking the time to make me a special meal. I had a lovely time, and I would not have wanted it any other way. Thank you so much for attending my birthday party. I appreciate the laptop you bought for me, I needed it the most. I hope you had a great time too. Have a nice time. Bye. You really knew what to give me to make my birthday special. Your gift was awesome and I really appreciate it. Thank you for the champagne you sent for my birthday. What a lovely thing to sent on happy day; you know I love champagne. It was really celebrated on by my chums. I really appreciate the generous gift for my birthday. I have had enough fun with the money and yet I spared a few dollars for a new laptop computer. That was generous. Thanks again. Every year I look forward to the unique, creative way you express birthday wishes to me. The gift was great! Thank you for the gift voucher you sent me for my birthday. I have bought new shoes and a camera which I have always wanted. Thanks also for your presence at the party and I hope you enjoyed. I wish to see you soon. Thank you so much for the watch you gave me for my 71st Birthday. I have had all my attention daily at the watch since I received it. What a wonderful gift to get on a lovely day! Thank you both for the adorable gift. Thank you for the nice pair of football boots you sent for my birthday. I will be sure to keep them in a good condition because I treasure them. Send greetings to all my cousins and inform them of my visit. Thanks you for the Playstation kit you gave me for my birthday. I enjoy playing with my friends. It is really cool and they love it. I spend ages in front of my screen. Thanks again! Right now, I’m thinking of your awesome birthday wish, so right now I’m telling you how awesome you are. I just wanted to write and say thank you for the money you gave me for my birthday. You have really helped me buy some of the items I have yearned for. I now own a Sony camera and a phone because of the money. The remaining amount is safe with my mom for the time being as I am going to use it to pay for my tuition in school next term. That was by far the best birthday party I have ever had. I cannot begin to fathom how you pulled off a surprise party without me knowing about it! To say I was shocked would be an understatement, and I can only imagine the effort it took. Thank you so much for making this birthday one I will never forget! I cannot believe you did that! You are such a sneaky person! I have always wanted a surprise party, and I finally got to have one thanks to you. I know it was your idea and plans that made it possible. Thank you for making my ultimate birthday wish come true! Pleasant surprises are life’s little treasures, and the surprise birthday party you arranged for me was a precious gem I will forever appreciate. Thank you so much for the birthday dinner. You put so much effort into a beautiful table and my favorite meal. I could not have asked for a better evening surrounded by my favorite people! Celebrating my birthday has never been a priority for me. However, this year took the cake. I cannot thank you enough for showing me a fabulous time on my big day. It is definitely something I will never forget! I have never wanted a big party, and I thank you for creating the perfect alternative. A full day of doing and eating my favorite things was just what I wanted. Thank you for making it happen because without you it would not have been half as nice. The best thing about birthdays is that I am treated like royalty for the day. Thank you, dear plebeian, for putting up with my demands all day long. You will be handsomely rewarded when it is your turn to be the birthday royal. You made this ruler feel extra special, and I would not have changed one thing about my birthday. Dear Classmates, Thank you all for coming to celebrate with me. It was one of the best birthdays I have ever had in my life and I am really anticipating for next year’s. Thanks awfully for my presents, they are overflowing! You are the best. Thanks again! Lots of love. Thank you so much for joining me to celebrate my 23rd birthday. I had a great time and I hope you all enjoyed it. I am really grateful for the gifts too. What great people to have! I am lucky to have you. Once upon a time, I was born. Happily ever after, I got to spend my birthday with all of my favorite people. Thank you for coming to my party last night to celebrate this wonderful thing called my life. My cake was delicious, the presents were sublime, and the decorations amazing. This was one of the best birthdays I have ever had. Thank you so much for the incredible party. I will cherish the memories forever thanks to my beautiful family and friends who were there to help me celebrate.